The Font dialog box allows you to specify a font, font size, style, and effect to apply to text in the Text Editor dialog box. To open the Font dialog box, select Format>Font from the Text Editor dialog box menu bar. To quickly change just the color of selected text in the Text Editor dialog box, click the Font Color: button. This option will also give you many more color choices than those available on the Font dialog box. Use the Font dialog box to set the font, font style, size, and effects for text in the Text Editor. Font Select from the drop-down menu a font to apply to the text. The menu contains all available fonts on your system. 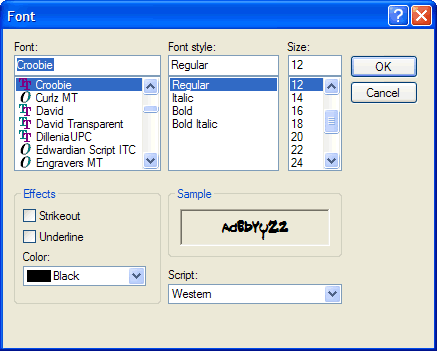 Font Style Select from the drop-down menu a style for the specified font. Choose from Regular, Italic, Bold, and Bold Italic. Size Enter or select from the drop-down menu a point size for the specified font. You may not enter a font size larger than 72. Strikeout Click to checkmark to apply a strikethrough to text formatted with the selected font. Underline Click to checkmark to apply an underline to text formatted with the selected font. Color Select from the drop-down menu a color for the specified font. Sample Displays a sample of how text will appear with the specified font settings. Script Select from the drop-down menu a language script for the specified font, such as Hebrew, Thai, Cyrillic, or Symbol. When you select a different language script, the character set for that language becomes available for creating multilingual documents. OK Click to accept the current settings and exit the dialog box.